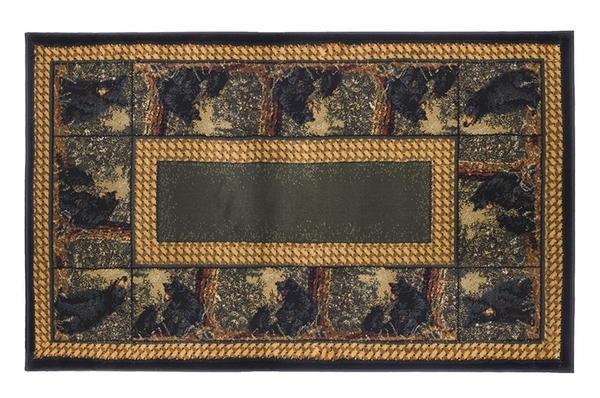 Product Dimensions: 30" x 50"
The deep green 30" x 50" Goods of The Woods rectangular rug is set to provide comfort, coziness, and underlying surface protection. With CPSC FF1-70 flammability test certification, this product provides hearth floor security and elegant surroundings. The gold and brown borders add a unique touch when paired with the intimate and traditional bear and tree elements. Burgundy touches complete the design, which is equal to the flame retardant soft material in terms of ingenuity and hearth appropriate qualities. Is this rug 30" in length or 30" in width? This is 30" in width, and 50" long. Very nice, goes great with my wood stove.